Best podcast ever! I tune in every single week. Their marriage and family tips, ideas, amd stories draw our family closer together. We both honestly became Christians because of these two. So thank you Roloffs! God bless & thx 4 eternity! Today's episode is another audiobook reading! We hope you guys are enjoying these. In this episode, we share about fighting the purity battle and how we struggled with it. This was probably one of the hardest chapters we had to write, but it has prompted a lot of great conversation from all of you! Culture has overvalued the wedding day and undervalued the promise of forever within marriage, in the same way, they have overvalued virginity and undervalued purity. So we unpack what purity looks like to us and how we should refocus our energy on fighting the purity battle and not just the virginity battle. More audiobook readings! We are reading from the chapter titled A Creative Type of Love. This is our favorite chapter! I know we said last week that the Principle of Sharing was our favorite, but this truly is our favorite. We share stories from when we were dating about how we chose to PURSUE CREATIVELY. DATE INTENTIONALLY. LOVE FAITHFULLY. This is essentially where our "Love Letter Life" began; in the typewriter letters, long distance dating, and desire to do things differently. We hope you enjoy listening to these audiobook readings. Share with us what your favorite chapter from "A Love Letter Life" is. What about it resonates with you? In this episode, we are sharing more of our new book, A Love Letter Life! , is probably one of our favorite chapters in the book. It talks about a love story that helped shape our love story. And within that story, there is a principle that we loved and chose to be intentional with it. We are talking about the principle of sharing. , Loving what they love, and allowing yourselves to build thousands of strands of oneness and togetherness. There is plenty more to get from this episode so make you listen! 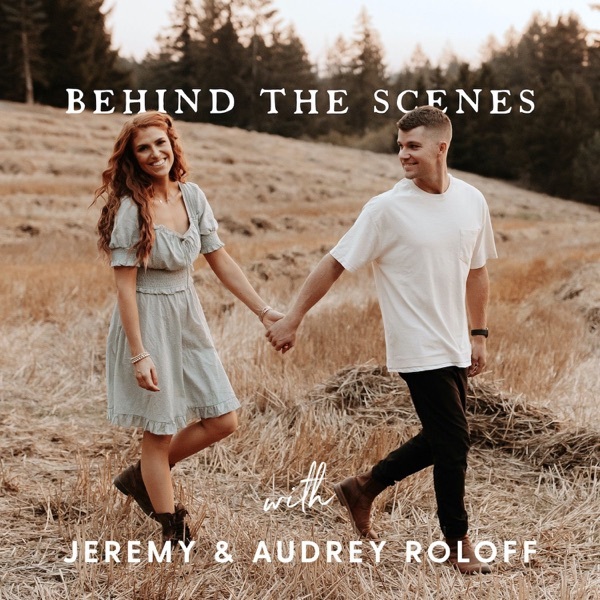 Follow us on Instagram: @behindthescenespodcast @audreyroloff @jeremyroloff Grab a copy of A Love Letter Life or get the audiobook. And yes, we are the ones reading the audiobook! Book tour info: ALoveLetterLife.com All the things: The Marriage Journal Alwaysmore.com TheRoloffs.com We buy 5 of you coffee on every episode release day, all you have to do is screenshot the episode and share it in your Instagram stories and tag us! For this week's episode, we are so excited because we are sitting down to interview the couple who has probably had the biggest impact on our love story in our marriage today. Chris and Jamie Herb. Jamie was Audrey's college mentor and Chris was the Area Director for Young Life when Audrey was in college. Chris and Jamie had a huge impact on Audrey's college experience. When Audrey started dating Jeremy, and they got engaged, they asked Chris and Jamie if they would do the premarital counseling. They inspired the Marriage Journal. They inspired so much of our book, A Love Letter Life, which is available everywhere now! They were huge supporters of Jeremy and Audrey in their relationship leading up to their wedding day and to this very day as well. And also just huge supporters of them in the writing of A Love Letter Life and Beating 50 Percent and all the other things that they do. We hope that you receive something amazing from this interview because it is full of gold! It's book launch day!!! A very big part of the reason why we wrote A Love Letter Life, was that we felt very strongly, when we were engaged, that we wanted to be more intentional about preparing for our marriage than preparing for our wedding day. It's something that our culture as a whole, especially our generation, has lost sight of. We spend all this time planning this epic wedding day, but then forget to prepare for an epic marriage. That's something that we are really passionate about. So we are going to share six things with you that found super helpful during our engagement that helped us prepare for our marriage. Hopefully they will help you in whichever walk of life you are currently in. To order our book, go to: https://aloveletterlife.com. In today's episode, you’ll be the first to listen to our audiobook recording of A Love Letter Life! We're super excited that we got to be the voice behind our own love story. And we're really excited for you guys to be the first to listen to the audiobook recording. We’ll be reading the first few sections of the book: “our first letter” and “the beginning.” If you haven't already, you can preorder either the audiobook or the hardcover at aloveletterlife.com or anywhere books are sold. In this podcast, we share 8 ways to pursue Jesus in college. Love is in the air! This week we're going to talk all about Valentine's Day, 36 questions, and three sentence love stories, which is something that we started four years ago. Valentine's Day is extra special to us because we also launched Beating 50 Percent on Valentine's Day four years ago. Love is worth celebrating and we are excited to celebrate it with you in this episode! You asked, we answered! Last week on Instagram, we asked you guys to send us questions you’ve been wanting us to answer. In this episode, we dive into some of those questions! We discuss where we went on our honeymoon, the biggest disagreement in our marriage, the hardest thing about being new parents, and so much more! This is a super fun, true, and real Behind the Scenes episode! Stay tuned for a show notes page with all the links and things mentioned in this episode! Last week we did a two-night marriage retreat with some mentors of ours. In this episode, we describe what we did and why it will be the most productive thing we do all year. This week we sit down and talk with our friends, Aaron and Jen Smith. They have been married for 12 years, are raising 4 children, and successfully run a business together. They have a ton of wisdom (and some fun stories!) when it comes to balancing family and work, all well striving to be better along the way. Stay tuned for a show notes page with all the links and things mentioned in this episode! We are back after taking a few weeks off over the holidays and we want to give you a behind the scenes look at our time away. We spent the holidays unrushed and unpressured with family and friends, relaxing fireside, enjoying traditions, and writing our goals for 2019 - which we are excited to share with you in this episode! Head over to our Instagram (@behindthescenespodcast) to tell us some of your goals for this year! Stay tuned for a show notes page with all the links and things mentioned in this episode! In this episode, Jer & Auj share their three-step process in making big decisions and setting goals. This was an episode that we wished was longer and one you won't want to miss. Before every race, on graduation day, her wedding day, and the day of her daughter's birth, Audrey wrote these simple yet powerful words on her hand - “ALWAYS MORE.” In this episode, Jeremy Interviews Audrey as Audrey shares the story of how Always More® started, how it’s evolved, and how the Always More® mindset can change your life. With inspiration from Ephesians 3:20, ALways More® will empower you to believe in the more that is within you, and that you are capable of immeasurably more than you ever imagined. No matter what you might be facing today, this episode will inspire you to ALWAYS believe in the MORE that is within you! Christmas is just a few weeks away and we thought it would be fun to give you a Behind The Scenes insight into what Christmas looks like and means to us. This time of the year can be overwhelming and distract our focus from the thing that matters most: Emmanuel - God with us. But we hope that you feel inspired (and find laughter!) as we share Christmas memories as well as some of our Christmas traditions and favorite holiday things with you! Stay tuned for a show notes page with all the links and things mentioned in this episode! The Marriage Journal is something we committed to during our first year of marriage and it has been such a useful tool that has pushed us to connect, reconcile, and grow in our communication. We are really going Behind the Scenes in this episode as we share some of our own marriage journal entries with you (holding nothing back!) from our first few weeks of marriage and from a few weeks ago. Stay tuned for a shownotes page with all the links and things mentioned in this episode! In this episode we share the insanity that we endured during our first week of married life. We’ve never told this story before and we think you’ll laugh and hopefully be encouraged if you are going through a not-so-glamorous time or trial. If you’re feeling disappointed or frustrated, we hope this episode reminds you that hard circumstances don’t have to dictate the health of your relationship. Stay tuned for a shownotes page with all the links and things mentioned in this episode! People say, if you can survive a home renovation, then you can survive anything. We survived two home renovations in six months! Not to mention, one of those renovations took place while Audrey was seven months pregnant and the other when Ember was only one month old. Through the renovation we learned a lot, the hard way! We are taking your behind the scenes into our home renovation process, both the intentional renovation and the unintentional second renovation that was thrown our way. We're going to talk about how we did it, what went wrong, what we did wrong, what we're so glad we did, and share some tips and tricks that we learned along the way. We hope this is helpful to you and makes you laugh a little! Stay tuned for a shownotes page with all the links and things mentioned in this episode! If you have been following us for any length of time, you know how much we are obsessed with the enneagram. So we are super excited to have an enneagram expert as the first guest on the podcast! Chris Heuertz teaches about the enneagram in workshops and at retreats all around the world. We hope you learn a lot from listening into our conversation with Chris as he shares how valuable the enneagram is for self-growth, self-discovery, and relationships. Stay tuned for a shownotes page with all the links and things mentioned in this episode! After 14 years over 300 episodes and 17 seasons I made the decision to leave Little People Big World. It was an amazing run and played such a huge part of my life. I would do it all over again, which I believe sums up my feelings about it pretty well. However, there are seasons for everything and in this next season, Audrey and I want to shift our focus. We want to focus on our calling, not just our comfort. In this episode, we dive into why I decided to leave LPBW. Stay tuned for a shownotes page with all the links and things mentioned in this episode! It has been a year of change for our family! We had Ember, moved into and renovated our new home, decided to leave our family’s TV show, wrote our first book, and so much more. We are excited to share with you what we have been up to, what we are currently struggling with, all the exciting things that are in the works, and also what we are loving lately! Stay tuned for a shownotes page with all the links and things mentioned in this episode! Welcome to the Behind the Scenes Podcast where we share the messy, honest, unfiltered and not so curated parts of our life. You will learn the reality behind our social media feeds, business, ministries, and what you may have seen on tv as we get honest and open about relationships, family, faith, business, and whatever we are learning about, fighting about, or laughing about lately. But you won’t just hear from us! We are sitting down with the people who inspire us most as they share the behind the scenes reality of their lives. We hope each episode will feel like an invitation to our dinner table or a conversation around a campfire. Think of this podcast as a bunch of bloopers with some truth bombs sprinkled throughout! Ultimately, we believe that your behind the scenes is more inspiring than your highlight real. And we are excited to share go behind the scenes with you!